Identify and recognize the characteristics of high-performance multi-slide glass doors as defined by national standards. Investigate the design potential and innovative opportunities to create buildings that allow direct connection to the outdoors. Assess the functional contributions of multi-slide glass doors as they contribute to green and sustainable design. Specify multi-slide glass doors in a variety of green and conventional buildings and formulate appropriate selections related to specific applications. Creating a visual connection between indoors and outdoors has long been a design goal in both commercial and residential buildings. Going beyond the visual and creating an actual physical connection between the two has often relied on a series of doors with interrupted access at the spaces between those doors. However, new product offerings using multiple sliding door panels that stack or store in wall pockets now make it possible to fully connect indoor and outdoor spaces, without the interruptions. When open, the indoor spaces extend outward to create an outdoor living experience with all the benefits of fresh air and daylight. When closed, attention to details and performance characteristics assure that the multi-slide doors provide the needed protection from the weather and climate conditions. Many building designs seek to capture outdoor spaces as part of the overall usable space related to a particular building. In commercial building designs, restaurants, office buildings, and apartments all can benefit when outdoor weather conditions make it more compelling to function outside rather than indoors. In residences, rooms that flow into patios, decks, or natural outdoor areas such as beaches or wooded areas, give residents a direct connection to those outdoor spaces. In all cases, it is the interaction between indoors and outdoors that becomes the key design focus—how to create the transition space or mechanism to allow the enjoyment of the outdoors but still access the functional needs of the indoor spaces. Many 20th century architects worked with this concept of connecting indoors to outdoors but were limited by the technology and products of the time. The glass houses of Phillip Johnson and Mies van der Rohe created the celebrated visual connections but relied on conventional swinging doors to make the physical connection. Frank Lloyd Wright often used a series of double swinging french-style doors that opened out against the sides of a column or pier, making the whole assembly appear as a colonnade with the doors visually disappearing. All of this was contemporized into the mainstream home construction market through the use of sliding patio glass doors that typically provided one fixed and one movable sliding panel of framed glass at the same head height as other swinging doors. Buildings of all types and designs can benefit by incorporating multi-slide glass doors to enlarge the perceived usable space. 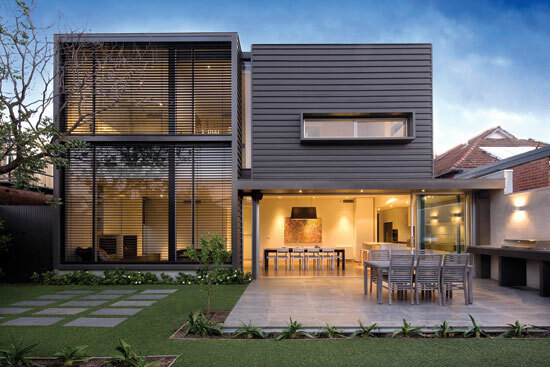 Multi-slide glass doors seamlessly connect indoor and outdoor spaces when open while quality fabrication assures proper performance when closed.